Meghalaya, literally meaning ‘abode of the clouds,’ is a virtual fairyland of lush rolling hills, reminiscent of the Scottish moors. Its innumerable streams, meandering through hilly tracts, cascading waterfalls and placid lakes are fed by the plentiful rain it receives. It is the land of the Khasis, Jaintias, Garo tribals, who have still preserved their unique heritage and culture. The pristine beauty and salubrious climate make it a paradise for botanists and nature lovers. Shillong, its capital, perched at an altitude of about 1500 metres and referred to as ‘Scotland of the east,’ is one of the finest hill resorts of India. The official state language is English. Meghalaya has historically followed a matrilineal, system, where the lineage and inheritance are traced through women; the youngest daughter inherits all wealth and also takes care of her parents. About 70% of the area is covered by forests, which are noted for their biodiversity of birds, plants and mammals. Cherrapunji (Sohra) is the wettest place on earth, recording an average of 12,000 mm or 470 inches of rain a year. Among other places of interest are Nongkhnum river island, Lawshynna cave and Mawsynram, a picturesque village on a hill. 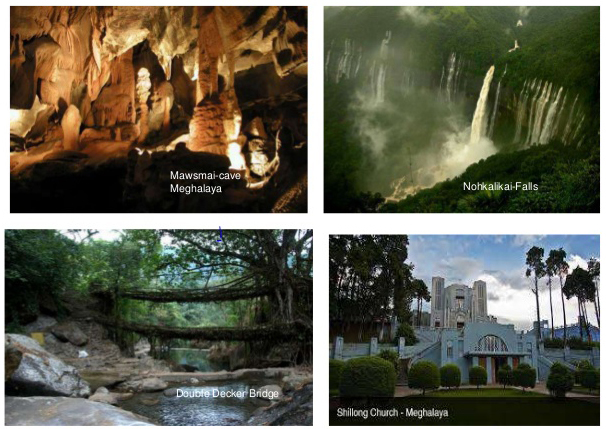 Places of interest: Ward’s Lake, Botanical Gardens, Lady Hydari Park, colonial churches, State Museum, Shillong golf course, Bora Bazar, Bishop & Beadon Falls. Around Shillong: Shillong Peak, Mawphlang (sacred forest grove), Jowai (limestone caves and cave temples), Umiam or Barapani Lake / water sports complex, Nartiang, Thadlaskein Lake. Airport: Umroi (35 km) and Guwahati (128 km); helicopter services also operate between Guwahati and Shillong.